I’m THRILLED that Amazon has chosen my historical novel, Keowee Valley, for their holiday store. All December long, Keowee Valley is available for your Kindle, e-reader, etc, for ONLY $1.99! If you’re looking to dive into an historical adventure–set in the wild Carolina backcountry of the late 1700s–from the comfort of your fireside, I hope you’ll choose Keowee Valley. To purchase Keowee Valley for ONLY $1.99, click here. And if you’d like to spread a little Christmas cheer for one thankful author, please share the news! 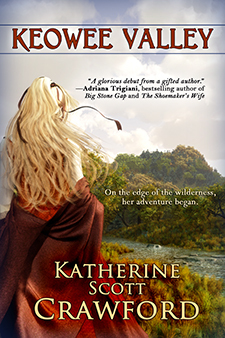 This entry was posted in Uncategorized and tagged $1.99, Amazon, Amazon holiday store, author, book sale, books, Cherokee Indians, Christmas books, Christmas gifts, fiction, historical adventure, historical fiction, historical romance, history, Katherine Scott Crawford, Keowee Valley, Keowee Valley sale, Kindle, literary fiction, literature, North Carolina history, novel, Quinn and Jack, romance, South Carolina history. Bookmark the permalink.